Cinematic Paradox: "The whole purpose of life is to have fun." "The whole purpose of life is to have fun." Starring: Juliette Binoche, William Shimell, Agathe Natanson, Gianna Giachetti, Adrian Moore, Angelo Barbagallo, Andrea Laurenzi, Filippo Trojano. NOTE: If you have not seen this film, I don't suggest you read this review any further. It's best you go in knowing as little as possible, like I did, because you'll definitely be better off. I admit, Certified Copy was a film that I became interested in when it was playing on the trailer loop disc back in August, but we never got any at the shop because it's one of those 'nasty' foreign movies that nobody likes. Certified Copy is one of those films that you should never judge by a trailer, or anything else, for that matter. It is really the kind of film which you just watch and absorb as it comes, and I love it for that fact. Through the trailer, you would suspect that the movie is a foreign/indie romantic drama between Juliette Binoche and British opera singer William Shimell (in his first proper feature film). But no, that is far too conventional. Certified Copy is never really anything; it can't really be categorised as a particular kind of film. It's in a league of it's own, even if it looks far too simple to be that way. The basic plot of the film is this: James Miller (Shimell) is a writer who is in Tuscany to promote his latest book, called 'Certified Copy'. He meets a woman (Juliette Binoche, who's character is never actually named even though she is listed as 'Elle' on IMDb), who then takes him for a drive to a local Italian village. The two strangers wander around discussing pieces of art and life in general. And there we have it: the reason why I liked this movie so much - it's conversation after conversation after conversation, with everything having a subtle meaning that begs to be listened to closely. Along with that, Abbas Kiarostami adds a large amount of ambiguity, which may be annoying in any other film, but he plays with it so cleverly. This whole "are they married" or "aren't they married" business has the potential to seem like a gimmick, but it is anything but. Kiarostami doesn't have a defining moment when he asks the viewer to change their opinions of the relationship between the man and the woman. It may appear that way when a woman at a cafe mistakes them to be a married couple, but I felt that even before that there were moments which suggested that they were married. Kiarostami slowly starts drip-feeding the idea that maybe that maybe they aren't really strangers from the very beginning. To be honest, when I got the first glimpses of that, I thought that maybe the two were just acting and playing along with each other, but by the end I didn't think that at all. There were plenty of good arguments made for why they weren't married or why they were married that it is a little impossible to choose one properly, but by the end you just start believing that they were married because they make such a great case for it that you kinda forget about how they really came together. It's a magical thing that Kiarostami does; it's like he planted an idea deep in our brains right at the very beginning and it just eats it's way through as the film goes on. Usually that's not the type of thing that would expect from a romantic drama, but as I said, this film is fairly unconventional, while looking deceivingly conventional. From a technical stand point, Certified Copy is flawless. The camera has a love affair with Italy and the exquisite location they chose. It's an absolute delight to look at, but not as much of a delight as it is to listen to. The script is perfection, thanks to both it's deliberate ambiguity and the lovely, flowing conversations. Also, the languages spoken are changed from time to time, with French, Italian and English all making an appearance, sometimes with the man and woman sliding between French and English in one conversation. As for acting, Binoche and Shimell do brilliant work, but particularly Binoche, who is masterful. She has striking fluidity which helps bring several of her interesting characteristics to the fore, making for an interestingly multi-faceted character who is a delight to watch. Shimell is good, especially considering this is his debut feature film, and while he lacks the same magnetism that Binoche has, he still holds his own against her, especially in the scene at the restaurant where they have a fight. 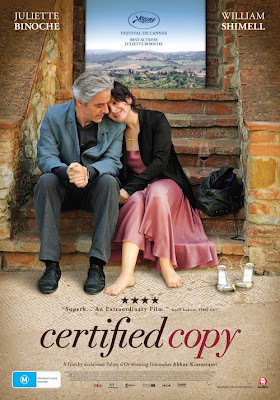 Whether their marriage is real or not, a copy or an original, there is no denying that Certified Copy is a brilliant film. If this is still classified as a 2011 release, I would rank this as the best of the year so far after Midnight in Paris...it is seriously that good. "Elle" is French for "she", so it's probably not meant as an actual name. I haven't decided if I really want to see this or not. I know everyone seems to think Kiarostami is great, but I must admit to not really being blown away by the other films of his I've seen (which is, admittedly, only two or three). This is one of my favorites from the last year as well. But I'm a sucker for Juliette, and also the use of multiple languages. James - That's what I was thinking. That seems like the logical explanation. This is my first Kiarostami movie, and it is pretty good. I wouldn't say that it is mind-blowing, but really good. Mette - Give it a go! Bonjour Tristesse - I'm a sucker for Juliette and the use of multiple languages too! I LOVED this movie, and I highly recommend you check out some of Kiarostami's other films. He has made two must-see movies which I think you will love, TASTE OF CHERRY and THE WIND WILL CARRY US. He has made a lot of fantastic films, but those two are his best. I definitely will check them out. Especially if they're as good as this one! I'm always so appreciative of contemporary films which pay attention to things like beautiful photography. There's this sort of fallacy that only period films need to beautifully, and this film just looks gorgeous - the entire film is gorgeous, as it is bewitching as it is exasperating. Kiarostami is intentionally being provocative, and kudos to him for never turning provocative into unnecessary sensationalism. This movie is easily in my top five for the year, maybe higher. I really need to see it again - one time in the theatre isn't enough. It was highly amusing, though, to hear everyone else complaining about it on the way out of the theatre - it's clear they were expecting, as you said, a nice drama/romance with pretty scenery, not an existential meditation on the nature of originals and copies. I haven't seen any other Kiarostami films, but they're all on my must-see list now. Andrew - Yes, the film is devastatingly gorgeous. I totally agree with you! Jandy - I saw it twice within a week and I absolutely adored it both times...it's quite rewatchable. I certainly wasn't expecting what I got, but I was delighted with it. I haven't seen any other Kiarostami films either, but I'll definitely track them down now!